Welcome to the official website of the Indiana Healthy Marriage and Family Coalition, Inc. The mission of the Indiana Healthy Marriage & Family Coalition is to identify and promote the value of healthy marriages and vibrant families. The vision of the Indiana Healthy Marriage & Family Coalition is to encourage and support healthy marriages and families. Help Strengthen Families: Donate Now! April 2nd, 2019, 6-8 p.m. inside East 38th St. Library, 5420 E. 38th St. The Fatherhood Forums are sponsored in part through the Indianapolis Public Library Foundation and the Indiana Healthy Marriage and Family Coalition, Inc. Someone once proposed that it is not until one becomes angry enough, that real change takes place. Outraged over the murder of their Soror by her estranged husband, Delta Sigma Theta Sorority, Inc., Indianapolis Alumnae Chapter, led out by calling the community together to rally around healthy marriages and families. Dr. Ruth L. Lambert, as the Chair of the Family Life Education Committee, started exploring “best practices” nationwide and serendipitously connected with the Healthy Marriage Initiative. The outgrowth of this connection was the Indiana African American Healthy Marriage and Family Coalition and the umbrella organization the Indiana Community Healthy Marriage and Family Coalition and over 200 community partners. 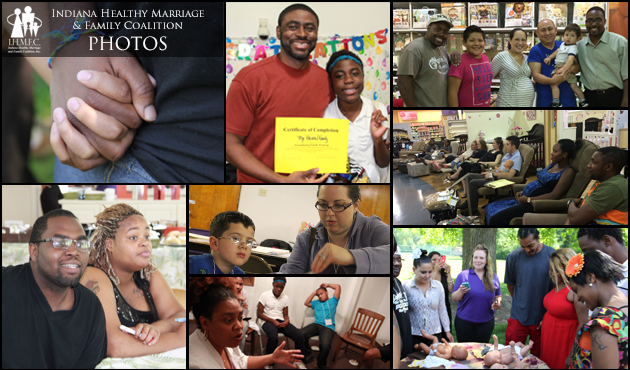 (c) 2013-2014 Indiana Healthy Marriage and Family Coalition, Indianapolis, Indiana. All rights reserved.